Today, I stumbled across IKEAs Flokati rugs on their website. I thought, we could never compete with such a massive company as IKEA because they buy enormous quantities.. but when I looked closer I noticed I was wrong. Our Flokati in our lightweight quality (1700g/m2), costs just £72 for the size 140×200 cm – and that includes free delivery. 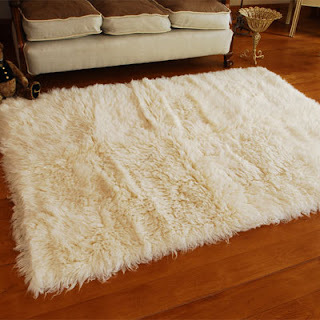 It is handtufted in 100% fine wool from New Zeeland in the Flokatis homeland Greece. So..consider this next time you buy a rug, that the rug you think might be the cheapest one isnt always really the cheapest one! This entry was posted in brown flokati, custom made rugs, flokati rugs, shag rugs, white flokati. Bookmark the permalink. New rugs – checked and photographed and very very nice! I've just met you, and I'm absolutely amazed with everything : design, prices, quality and the care you put on environment! I bought a superb rug at Ikea ( a thick, colourful and expensive one ). I would be delighted to buy some rugs from you, but unfortunately I noticed that you don't despatch to Portugal …. I wonder why (!?). I live next to Spain !! Yes, we can deliver rugs to Portugal. It’s not too expensive, just checkout and the website will calculate the shipping price based on the size and weight! We use UPS for the shipping.